How to transform a graph horizontally or vertically? How to vertically or horizontally stretch or compress a graph? How to transform a graph horizontally? shifts f(x), k units horizontally. if k > 0, the shift is to the left. if k < 0, the shift is to the right. How to transform a graph vertically? shifts f(x), k units vertically. if k > 0, the shift is upwards. if k < 0, the shift is downwards. The following diagram shows some examples of vertical stretch and compress of graphs. 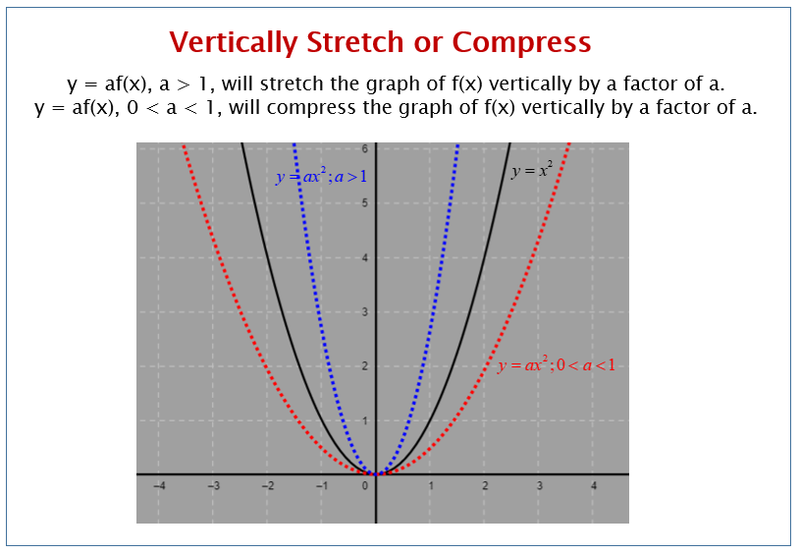 Scroll down the page for more examples and solutions on stretching and compressing of graphs. How to vertically stretch or compress a graph? y = af(x), a > 1, will stretch the graph of f(x) vertically by a factor of a.
y = af(x), 0 < a < 1, will compress the graph of f(x) vertically by a factor of a. How to horizontally stretch or compress a graph? y = f(bx), b > 1, will compress the graph of f(x) horizontally. y = f(bx), 0 < b < 1, will stretch the graph of f(x) horizontally. This video explains to graph graph horizontal and vertical stretches and compressions in the form af(b(x - c)) + d. This video looks at how a and b affect the graph of f(x).